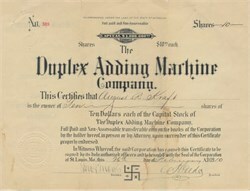 Beautifully engraved certificate from Duplex Adding Machine Company issued in 1910. This historic document was printed by the Gast Banknote Company and has an ornate border around it with a vignette of a Swasika with math symbols. Prior to the Nazis, the Swasika had been for centuries a symbol of peace, laughter, joy and good luck. It is one of the oldest symbols of mankind. After the Nazi's, it is now associated with evil and Hitler. This item is hand signed the company's president and secretary and is over 90 years old. The certificate has some ligt water stains and shows some light signs of wear.